OpEd: Must a Good Business Education Be Anti-Business? (1) The writer discerns the consensus that has emerged in universities in favor of “rounding out” a business education with liberal arts courses (and business ethics courses, whether offered within or outside the business school) emphasizing the ethical failures of business and the reform of capitalist economic institutions. This consensus informs the founding of university-based business schools beginning in the late 19th century, as documented in (for example) Rakesh Khurana’s book From Higher Aims to Hired Hands. Is this the only way to conceive of the liberal arts’ contribution to business education? If not, is it the best way? I am a recent graduate of Bentley University, a small business-oriented college located in Waltham, Mass., just outside Boston. The school typically ranks among the top 25 undergraduate business programs in the country. Like many other business schools, Bentley prides itself on an advanced business curriculum infused with “the richness of a liberal arts education.” Yet rather than providing a solid grounding in the classical humanities—which would be very useful in the business world—many of the nonbusiness courses I took espoused an illiberal attitude toward American capitalism and business in general. Unfortunately, only 20% of the 122 credits that I needed to graduate went toward satisfying the requirements for my Finance major, while more than half of the courses that I took seemed designed to turn me into a self-loathing Finance major. I guess this isn’t surprising. The humanities departments tend to be staffed by Marxist crackpots who accept Marxian pseudo-economics and pseudo-social science rather than real economics. Of course, your English professors are going to be anti-market. But their opinions about the market are of no more worth than a creationists’ opinions about biology. 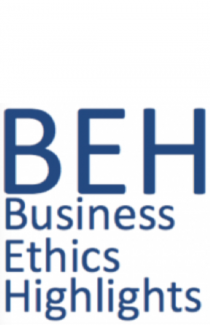 As for the field of business ethics itself, as a matter of history, it was largely started by low quality philosophers who couldn’t cut it in the mainstream journals, and who wanted to write about business ethics precisely because they dislike business. The field didn’t have to be that way, but it just happened to start like that. And then inertia, bias, and path dependency set in, and the field tends to stay that way. So it goes. But the Bentley student shouldn’t loathe business. Rather, he should loathe academia for being so tolerant of shoddy, ideological work. I think this is just a sociological phenomenon rather than something that’s actually justified. For various historical reasons, most of the humanities departments have been captured by heavily ideological people enthralled with Marxian pseudo-social science. That your English professor hates capitalism is if no more intellectual interest than that a creationist despises evolutionary biology. Humanities professors tend to be crackpots when it comes to social science. As for the field of business ethics itself, historically, the field started with (and unfortunately is still dominated by) largely third-rate philosophers who couldn’t cut it in regular philosophy journals, and who also wanted to write about business ethics precisely because they were ideologically opposed to business and markets. Once the field gets going that way, bias, inertia, and path dependency tend to keep it that way. The fact that he’s getting an anti-market education is probably an accident of history and a product of academia’s unfortunate tendency to act as a welfare system for cartoon ideologues. I hope the student asks for his money back. Few of us are “anti-market.” There is, however, considerable disagreement as to what constitutes a “free” market and how to enhance equity, efficiency, and voice in enterprise. If you group everyone who has ever doubted the operations of “markets” in specific contexts as “Marxist,” wouldn’t you have to classify Adam Smith as a Marxist? I take Marx at his word that he wasn’t one. What do you think, Jeff Moriarty? Would studying Italian cooperatives be anti-business? Francis, I’m not sure I understand your question. Is it rhetorical? Cooperatives are just another (relatively rare, but only relatively) form of business organization. The canonical interpretation of their frequency (with special attention to the Italian example) is Henry Hansmann’s book, The Ownership of Enterprise. Thanks for your response, Chris. Hansmann takes a transaction costs perspective toward cooperatives and “normalizes” them within the discourse on corporations, I think. On the other hand, many reformers favor a vastly expanded cooperative economy. My point is that one might be a critic of corporate capitalism and propose an alternative form of enterprise, democratically organized, but still a market actor.